The house as you can see was lovely but in need of modernisation and this view, above, was taken from the entrance of the drive – so there was no presence to the front door, and everyone went round the back! Seen from the other side, the new entrance area features beautiful brick detailing and you can see how the drive sweeps in from the gates. 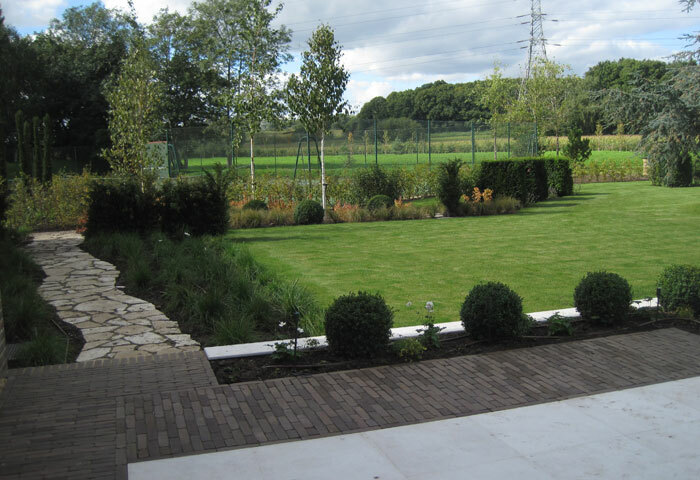 Formal planting around this area (which I couldn’t photograph this time as the vans were in the way!) 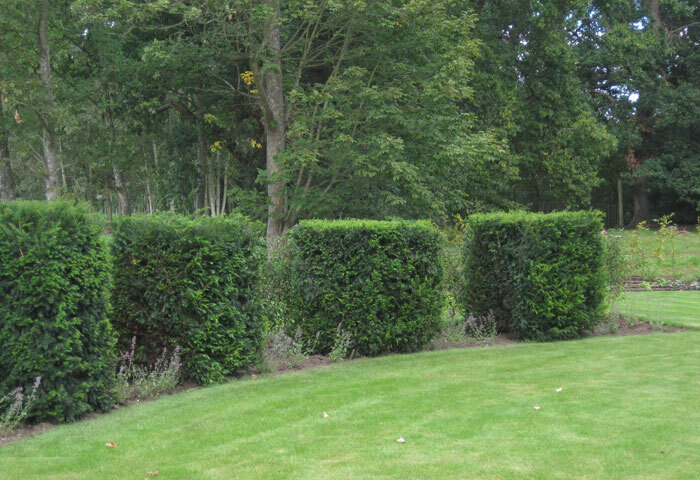 gives structure around the remaining two sides, with lollipop Portuguese laurel trees underplanted with lovely textural planting in shades of green and white. 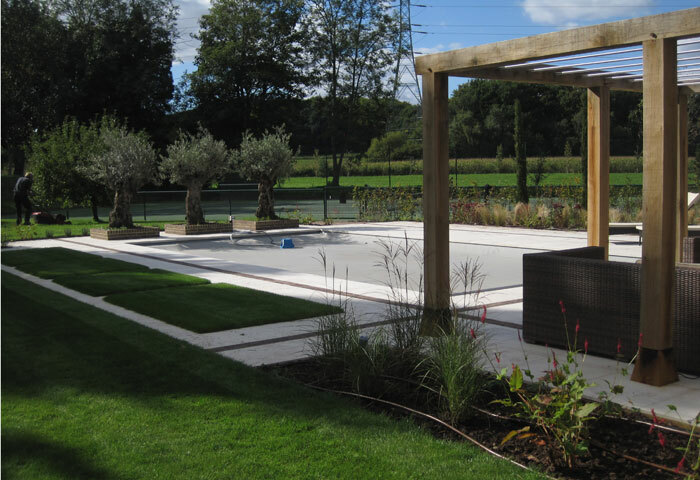 Looking from the other side, you can see how the front entrance is now enclosed from the more private and domestic areas of the garden – the pergola you can see in the photo is part of the swimming pool terrace which you can see below. 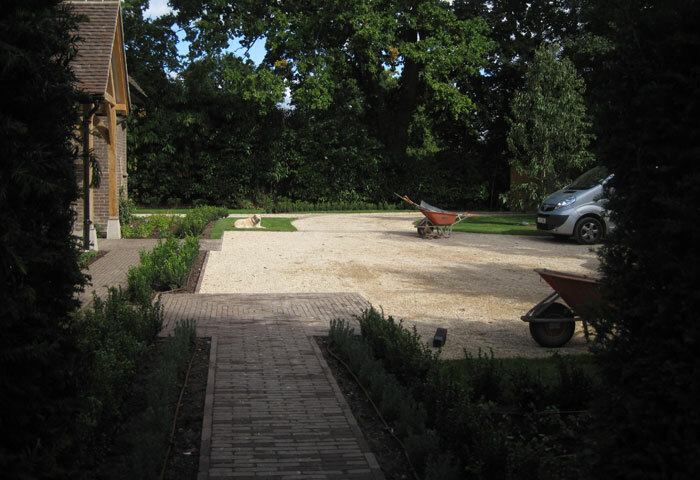 The brick path that started near the front door wraps around the house, enlarging into terraces and then narrowing to take you through to another space. 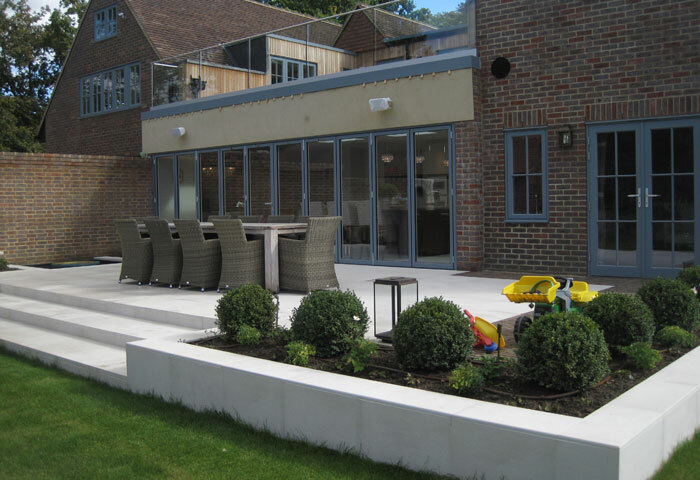 Here you can see it from the rear garden leading back to the pool terrace. 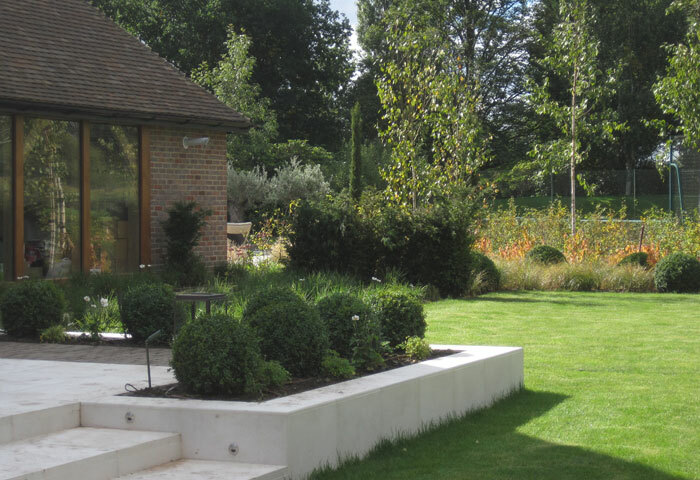 This in turn leads to a crazy paved path to the main terrace that will overflow with grasses when they get bigger, and sparkly lights inset into the path create a magical evening glow. 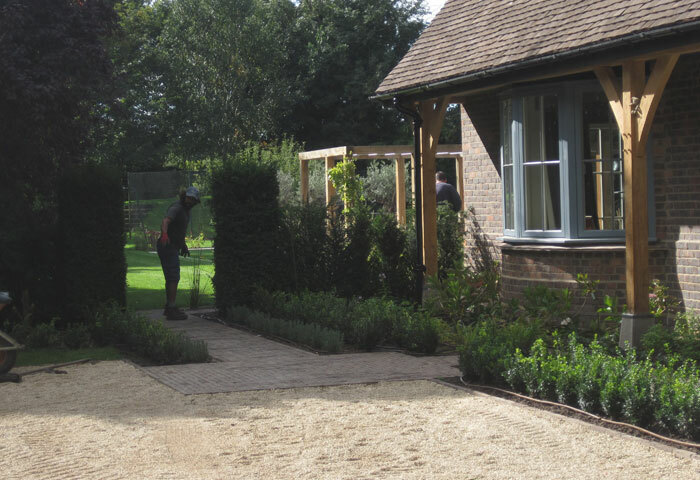 A gate is due to be put by the new yew hedge to enclose the main garden area from the pool garden. while a new wall separates the main terrace from the garage block. 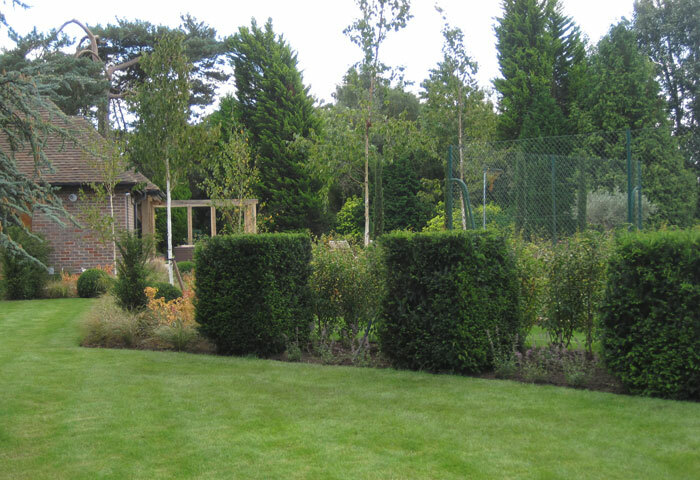 and keep the focus away from the tennis court – additional Portuguese laurel hedging backing the yew, and hornbeam hedging near the tennis court will create even more enclosure as they grow. 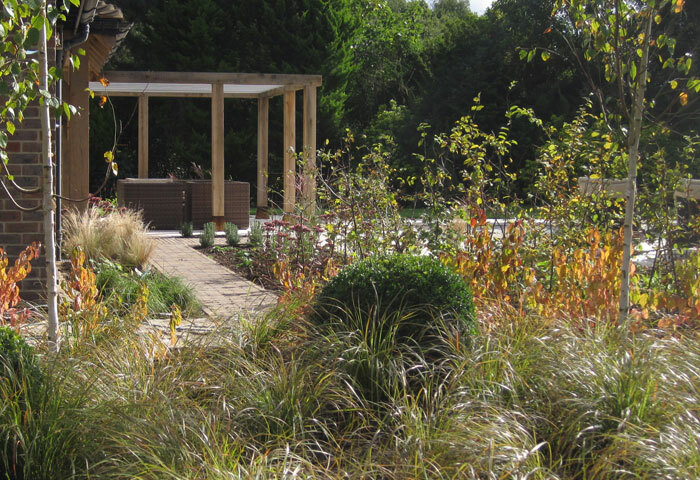 The planting has been designed to be varied and interesting in all seasons and I was lucky that it was such a glorious day when I visited! 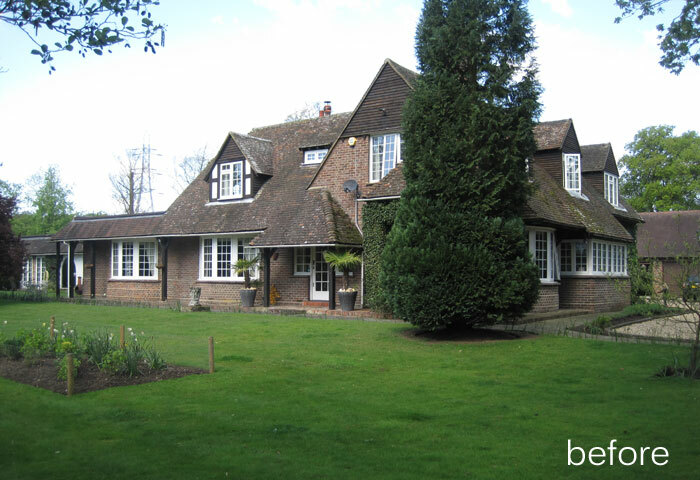 It’s hard to believe now but the site is actually a really awkward triangular shape which had previously been dominated by the tennis court and the garage. Now there is flow between the spaces and the best features of the site have been accentuated. This garden looks stunning, I love what you’ve done and it is so huge, dream garden, very inspirational. 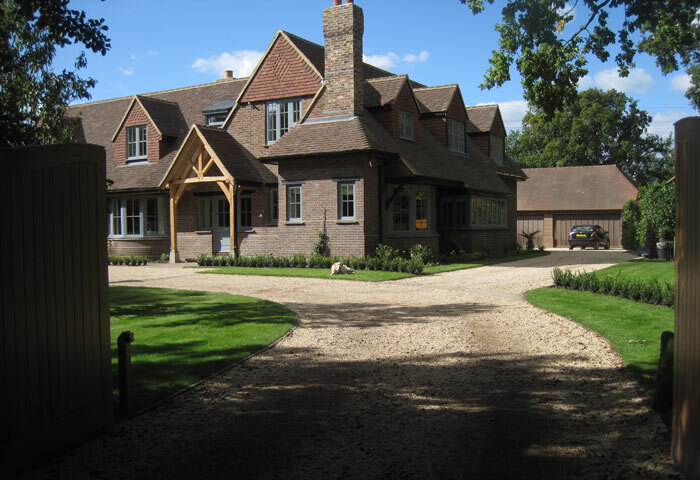 Its looking beautiful, I had forgotten what it looked like before and how much the design has enhanced the house and aspect of the surrounding grounds. Lovely to work with you. Looks pretty stunning, i bet the Silver Birch will really bring alive this winter. 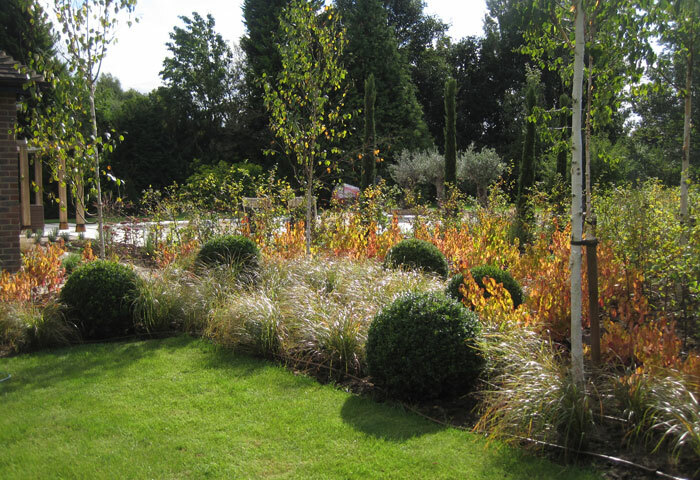 The birch are underplanted with Anemanthele lessoniana and twiggy orange stemmed Cornus – a wonderful combination especially when low winter light catches them from behind!